Decided to Rent Out Your Home. Now What? Most of our clients are investment-minded, and we love the notion of keeping your current home as a rental when you move out of the area or buy a bigger home. But, how do you know if you’re making the right decision and if you’re ready to be a landlord? We give you all the information you need to consider this 4-part series. Last week’s article — Should You Rent Out or Sell Your Home? — showed you know how to answer to that question. This week it’s the first steps you need to take as a potential landlord when it comes to your property and tenants. Confused about what happens next after you’ve made the decision to rent out your current home and not sell it? Even if renting out your home works for you both financially and personally, it still requires some preparation before you have any tenants move in! We will take you through all the initial steps, including getting the necessary paperwork, prepping your home, and finding good tenants. Remember, how you act and appear as a landlord will reflect on how your tenant will view you and your property. Get proper licenses and registrations submitted and pay any fees with your local municipality concerning rental properties. You may be required to fill out an application for a basic business license, register with the local tax office, and get a home inspection. 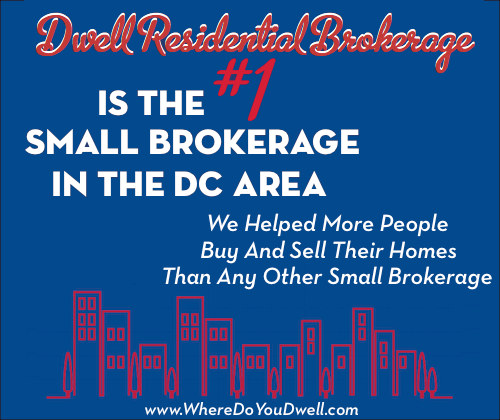 We will cover more details in our 4th installment, What to Know if You’re a DC Landlord. Decide what to charge for monthly rent. You can go online to sites such as Craigslist to see what similar homes are renting for in your neighborhood. At this point, you should have already figured out if renting will be a good investment for you or not. Remember that you will want to factor in about 25% each month for future maintenance and repairs. Come up with a set of tenant rules and policies. You want to start off any tenant relationship as professional as possible. Have a written policy of rules — how rental checks should be paid and when, how many people can live there, security deposit requirement, late fees on missed payments, or if you allow pets or not, property inspections, who to call if something breaks, etc. Stick to this policy! Have a rental application for tenants to fill out. Get name, current address, employment and rental history. You can find a template of one online. Include authorization to have criminal and credit screenings. Get your home in order. Now’s the time to fix anything that needs fixing, spruce up and paint to refresh where needed, and do a thorough cleaning. You want to attract stable and reliable tenants so your home should reflect what’s being offered in your neighborhood in terms of features and amenities if possible. Don’t go overboard with expensive upgrades though! Ensure your home is a safe environment and make sure you adhere to local codes. You want to make sure your home is up to code if it needs to be inspected before you rent it out. Find out if there are certain local codes you must comply with as a rental property. It may need to adhere to codes for heating, lighting, ventilation, utilities, occupancy space, cleanliness, sanitation, pest control, fire prevention, etc. Some basic things include installing a smoke detectors, a carbon monoxide detector, and provide a fire extinguisher. Familiarize yourself with local tenant laws and landlord requirements. You might want to contact a real estate attorney to clarify the laws, many of which favor tenants. Even when searching for tenants keep in mind equal housing opportunity laws. It’s good to find someone you trust and can contact when needed when something arises. You never can predict if you’ll face future issues with your property and tenants down the road, such as an eviction. Find out if there are any restrictions for renting out a condo unit in your in your building. Some buildings restrict the number of rentals to ensure the value of the building. You might have to be put on a wait list. Get proper insurance for a rental property. You’ll now need “dwelling” insurance that will cover any property damage, and also a policy for liability if someone gets injured on your property. You may also want to consider a home warranty plan for out-of-pocket expenses. Take some good photos of the inside and outside of your home. That way you’ll be all set to use them for any online listings or for a property management company. Get the word out and find reputable tenants. There are lots of options, such as Craigslist, posting on Facebook, friends, AirBnB, urbanigloo.com, rental.com or other reputable online services for rentals. Have your rental application and policy ready to hand out. Decide whether you will rent to family or friends. This could be a slippery slope so tread carefully. You don’t want to jeopardize any relationships so that’s why a written policy and professionalism are essential. Always run a credit and criminal background screening, which can cost $20-$30. Most of us are so trusting but this isn’t the time for it since your rental is a business investment now. No matter how good you feel about a tenant you must have them sign an authorization for these screenings. Ask for references from previous landlords, past pay stub, and see if they have job stability for their employment history. Have high standards but be realistic since very few people have a perfect credit score. If you don’t want to pull a tenant’s credit, ask them to include a recent (30 days old at the most) credit report with their application. Determine if they have ever been evicted. This could be repeat behavior on their part and you don’t want to rent to a serial abuser. Eviction records are public and can be found in court records. Credit reports also will indicate in the public records section if they have been sued for past rent. Make sure you have security deposit and first month’s rent BEFORE they move in. Once a tenant has moved into your home, it is harder to evict them because of tenant rights. Sign the lease. Decide the length of the lease. There are typical leases online for the state or city that you live in, so start there for an easy template. Make sure you include clauses that are important to you. For example, if you want your tenant to have the carpets cleaned upon their move out, now is the time to include that in the lease. Don’t forget to have tenant walk-through. Upon your tenant’s move in, walk through the property together, noting in writing and/or with photos what marks, scratches, damage they are assuming. Kind of like when you rent a car, they note where tiny scratches or dents are, so do that as well. This way, you can be clear about the condition when it comes time to give back their security deposit. You’ll avoid any back and forth about what the condition was before they moved in. 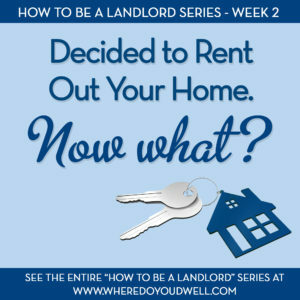 We are excited to bring you our How to Be a Landlord Series. If you aren’t sure you’re up to going this alone as a landlord, then next week’s article is perfect for you. Should I Hire a Property Management Company? will help you answer that question. Stay tuned!